Читаем и слушаем сказки. 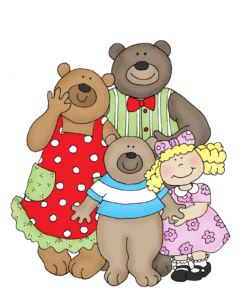 Goldilocks and Three Bears. Goldilocks and Three Bears. Златовласка и три медведя. How many bears? – Three bears! First there was a mama – Mama Bear. Here they come – mama and papa. Mama and Papa love Bear. Mama and Papa love Baby Bear. Look! Look! Look over there!Look over there! “BB” stand for Baby Bear! 1 (clap), 2 (clap), 3 bears. One morning the three bears were busy getting ready for breakfast. P: I’ll make the porridge. M: I’ll pour the milk . And they all sat down. And they all jumped up and down around the table. Very hot, hot! Much too hot! And let it cool off! Soon as the bears left, the House felt empty and sad. There was no one there, not even a bear. Now the House feels so lonely for the bears! He began to sing a sad little song. H: This is awful, this is bad! I feel lonely, I feel sad! It’s lonely here without the bears! Suddenly House heard a noise. I hope it’s a bear! But it wasn’t a bear. A little girl with golden hair. H: What did you say? H: What a beautiful name! When she saw the bears’ house. I wonder if anybody’s home! First she knocked on the door. H: Come right in! Come in and sit down! And knocked at the door. So she knocked once more. G: Look at the table set for three! And tasted his bowl of porridge. G: Oh, no! This is too hot! Much too hot! Much too big! And tasted her bowl of porridge. G: Oh, no! This is too cold! And the chair’s too hard! Much too cold! Much too hard! G: Mmm, this is good! Not too hot and not too cold! And Goldilocks fell on the floor! G: Oh, dear! What a shame! That’s a nice little chair! Oh, dear! What a shame! I think I’ll take a nap! And saw Papa Bear’s bed. G: This bed’s too big! Then she saw Mama Bear’s bed. G: This bed’s too hard! And it looked just right! Not too big and not too hard. The three bears came home. Someone’s been sitting in my chair! Someone’s been eating my porridge! M: Me oh my oh me! What’s this? Someone’s been eating my porridge too! M&P: Oh no! What a shame! I wonder who broke his chair! and walked into the bedroom. Mama Bear and Baby Bear followed him. Someone’s been sleeping in my bed! Someone’s been sleeping in my bed too! there was Goldilocks asleep under the covers, he began to shout. P: Look! It’s a girl! G.L. woke up and saw the three bears. and no one ever saw her again. Читаем и слушаем сказки. The Three Little Pigs. Читаем и слушаем сказки. Cinderella. Читаем и слушаем сказки. Little Red Riding Hood. Читаем и слушаем сказки. Snow White and the Seven Dwarfs. « Читаем и слушаем сказки. Snow White and the Seven Dwarfs.